For the second year in a row, Russia’s Alrosa was the leader in diamond extraction, and its share in global diamond extraction is estimated at 28 percent. RIR’s Evgeniya Nikolaeva went to the city of Udachny (lucky in English) to see for herself how diamonds are mined. The city of Udachny is located in the north of Siberia 10.5 miles from the Arctic Circle. Today it is one of the major northern diamond-mining cities. During the time of the USSR, large cities were built around major factories that were called city-makers as a result. Life here began in 1954 when Soviet geologist Larissa Popugaeva opened a kimberlite pipe nearby, but the mine was not immediately developed. Then in 1956, another pipe was built just next to it. It is one of the largest in the so-called Diamond Region, and gave its name to the city – Udachny. The Udachny quarry has attained a length of 1.3 miles and width of 1.1 miles. And it takes at least an hour on special transport to reach the bottom of the quarry. In the main shaft, one must always stick close to the guide as it is easy to lose horizons and working faces. Moreover, guests will not be able to see diamonds. As one of the miners admitted, cases where valuable stones were found by sight directly in the shaft are rare. He only remembered one time that this happened; a worker sifting through rocks suddenly noticed a sparkle in the wall, which actually turned out to be a large diamond. “I have worked here for 15 years and never seen diamonds,” confessed another miner. The technological process for diamond extraction is as follows: geologists determine “where to dig” and rock is dynamited clearing the horizon. Then drillers begin their work. Special underground dump trucks take the rock, hauling the ore to the bunker from which ore is transferred to the surface and sent to a processing plant. In 2013, more than 4,891,500 karats were extracted here. Identified diamonds are sent to a workshop where they are washed free of impurities by chemical substances. Next the diamonds await a journey of a distance of more than 310 miles to the capital of the Russian Diamond Region – Mir. This is the sorting center where diamonds are separated into groups by purity and size. After this they are sent to the Alrosa Unified Sales Organization where they will be prepared for sale to clients. In May 2013, the Russian company and the auction house Sotheby’s signed a memorandum on cooperation. According to its conditions, Alrosa can supply large premium-class diamonds produced by the company’s subsidiary Alrosa Diamonds, as well as jewellery with these diamonds, to Sotheby’s auctions. The highest quality diamonds go to the company’s jewellery subsidiary Alrosa Diamonds; however the jewellery business is not a priority for the company. According to Evgeniya Kozenko, in accordance with the company’s development strategy, all business development efforts are focused on diamond mining. 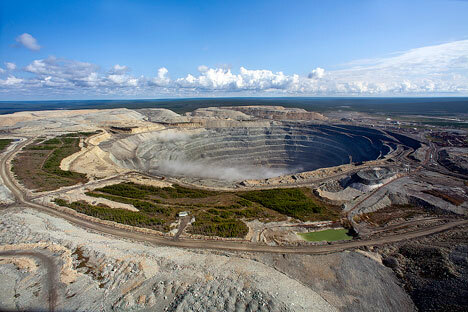 “Alrosa’s development strategy stipulates concentration on the core business – diamond mining. Alrosa is a mining company and does not plan to develop its jewellery business at this point. But the company does cooperate with many jewellery houses,” she says. The marketing system is built on the signing of long-term contracts with companies that produce diamonds and articles of jewellery with them. The company’s sales organizations have offices in all of the major global diamond centres – in the US, Belgium, the UAE, China, Great Britain, and Israel. The first phase of the Udachny underground mine is likely to be launched this month, with construction already reaching the final stage. According to the director of the Udachny Mining and Processing Division, Alexander Makhrachev, the company has high hopes for this mine. “If we currently extract 132 tonnes of ore a year, then next year – with the launch of the mine – the planned volume is 480 tonnes. The mine can be worked on for a long time – the projected capacity of the field is calculated at 60 years and proven reserves already total 159 million tonnes,” he adds.